Congratulations to Linda from 2 Brown Dawgs on winning our latest giveaway - a bottle of Wondercide Skin Tonic Spray! Have you entered our current giveaway? Win a copy of "The Richest Dog in Town" by Bruny Hudson. Check out the giveaway over at Glogirly - win a Peach Industries Kitty Lounger! It ends today so hurry and enter. 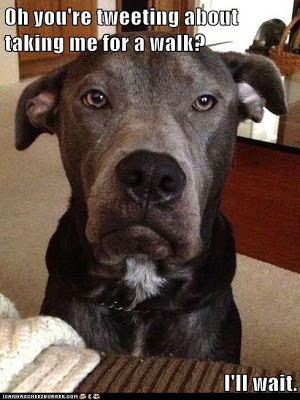 What will your dog do for a KONG Treat? 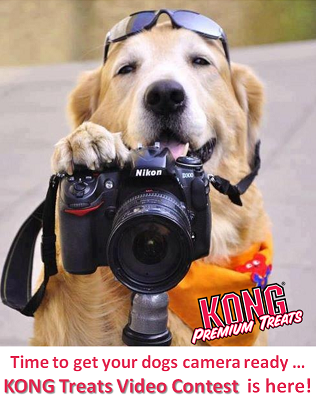 If you submit a video to KONG Treats right now of your dog doing something cool for one of their tasty treats, you could win 3 bags of KONG Treats just for submitting the video! The top 3 winners of the contest will win a variety basket and KONG Treats will donate 2 cases of treats to the animal shelter of your choice. Visit their Facebook page to enter and for more details. And speaking of tasty treats, my tasty Mother's Day strawberry treats for dogs and their moms was featured here along with some other tasty frozen dog treats. No, the tasty looking strawberries are not my photo. Mine were probably too ugly to use! 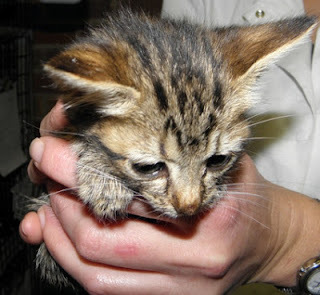 There's a little kitten named Peyton who's looking for a forever home. Peyton was injured by a child who was found twisting her neck. She's receiving veterinary care now and is recovering, but still needs that special someone to call her own. Visit this link to learn more about Peyton and how you might be able to help her. Are you a dog person or a cat person? Check out Caren Gittleman's guest post on the blog If They Could Talk. I absolutely loved the post and feel the same way - I'm an animal person! LOL the twitter one. We hope Peyton finds a forever home soon. Have a super Saturday. Yep - I really enjoyed that one too! Poor Peyton! We will purr and pray that she continues to recover and find a good home. Thank you for sharing what is going on around the blogosphere. We are kind of behind, so mom will go check all this stuffs out now. Thanks guys - I get behind too sometimes it seems =/ Mostly on the weekends, but trying to establish a new "schedule" since my daughter is out of school for the summer now. Paws are crossed for Peyton - hope he haven't to wait too long. I will check out all this links - Thanks! Have a great weekend. A lot of activity going on! Hope Peyton can find a furrever home quickly. I love your social sharing and thanks for the meow-out about dear Peyton. I will have some very good Peyton news to share really, really soon. Sure Caren :) That blog is in my Triberr feed and I saw the title, clicked, read and then saw your name at the bottom! Very cool to see that you wrote it - I should have known! What a lot of news. Brian said he had a Peyton update. I'll have to check it out. And thank you for writing about mom and dad's Kitty Lounger giveaway on Glogirly's blog!! They were pretty tasty treats :) You're welcome - I love that blog and thought it was awesome to see your lounger over there! Wow, what a great roundup of lots of goings on! We see that Brian has an update about Peyton ... we can hardly wait to read all about it! There's so much going around on the web these days that I really love posts that lead me to the good stuff I might have missed...Thank you! I know what you mean Gizmo... so many great things and so little time! Thanks for reading! I guess it's sometimes good to be late in commenting...glad Peyton is on her way to a furever home. Great roundup. That poor kitty! I need to post something about the Kong video giveaway. Thanks for the reminder! That's a super fun list! We'll have to check some of those links out! Oh my gosh. What is wrong with kids these days? Well I know, but it is a whole other post. :) Glad kitty found a foster. Thanks so much for doing the give away. I am looking forward to trying the tonic. Awesome - it's been sent off in the mail so it should arrive soon if it hasn't already.